Hemmesphere is an amazing cocktail lounge with a Morocco / Istanbul style décor in the Sydney CBD. Whether you’re chilling inside on the plush chaises lounges and ottomans or kicking-up your loafers on the Terrace – It’s simply decadent. The place is perfect for that stylish sushi dinner, free flowing cocktails and glasses of velvety vintage wines. The staff are always really friendly and the service is nothing short of exceptional. 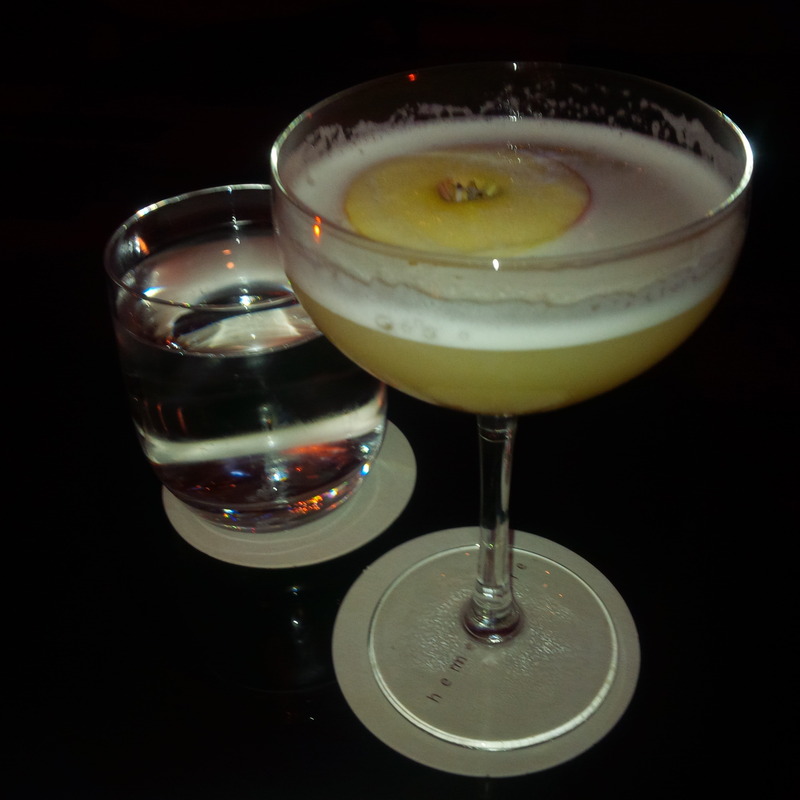 The night starts with a Junipear, a light gin based cocktail. It has hendrick’s gin, quince liqueur, pear (of course) and some coriander syrup. It’s sweet and oh so smooth on the tongue. This is a drink that has the T&T (Taste & Texture) absolutely nailed. It has a lovely grainy pear textured taste which defines it and a sweet fruity flavour. It’s a refreshing drink that leaves one relaxed and slouching back on the sofa admiring the wooden rafters of this beautiful bar. 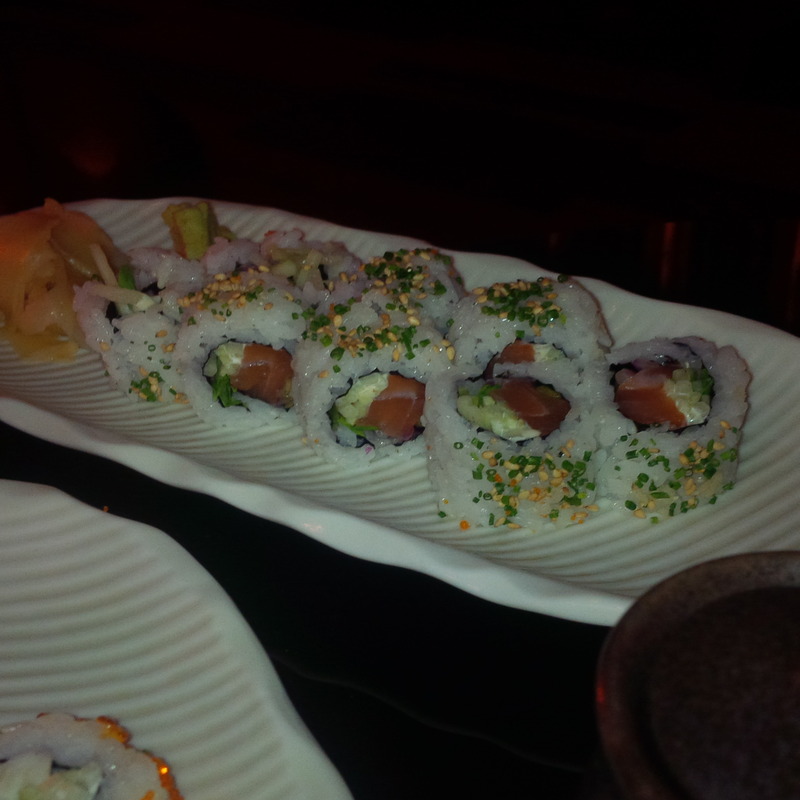 Then the sushi arrives. These are a work of art. 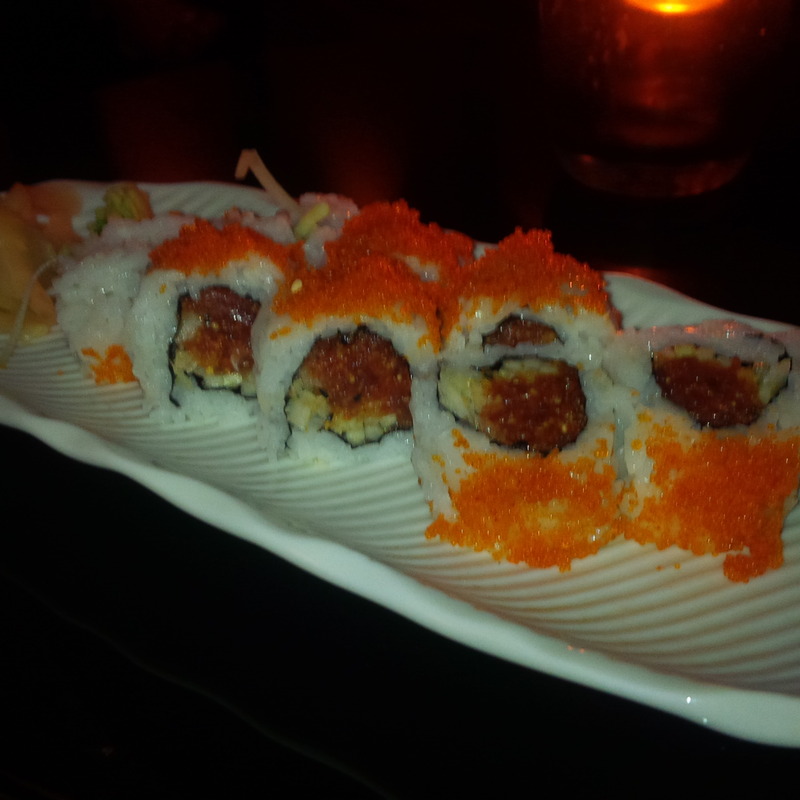 The place leverages the award winning sushi-e kitchen to deliver some fantastic Japanese cuisine. This roll has fresh tuna, avocado, mayo, cucumber and crunch with sesame seeds. The Tuna is fresh and beautiful. It is paired perfectly with a lovely soft creamy avocado and cucumber. The mayonnaise adds that light touch flavour to the dish that’s already firing on all cylinders. This dish is masterpiece, it compines spicy tuna pieces marinated in 7 peppers, chilli and sesame oil then rolled with sweet onion, cucumber and tobiko. This is the most amazing dish, the soft tuna meat with the kick of the spice, the textures of the sweet onion and cucumber and the salty sea flavour of the roe bursting on your tongue. There is nothing quite like it! 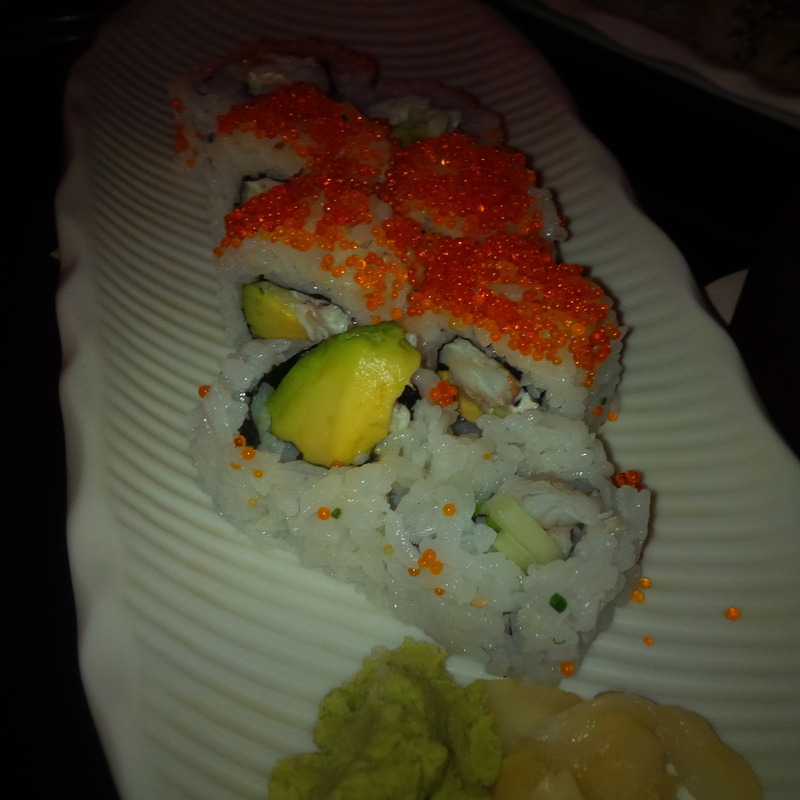 The roll has fresh blue swimmer crab meat, mayo, avocado, cucumber and red tobiko. The fresh distinct flavour of the crab meat defines the dish. It’s the star of the dish, the avocado, cucumber and mayo do their thing on the side but the crab is the real star. Nothing like fresh, succulent crab meat to get the taste buds going. 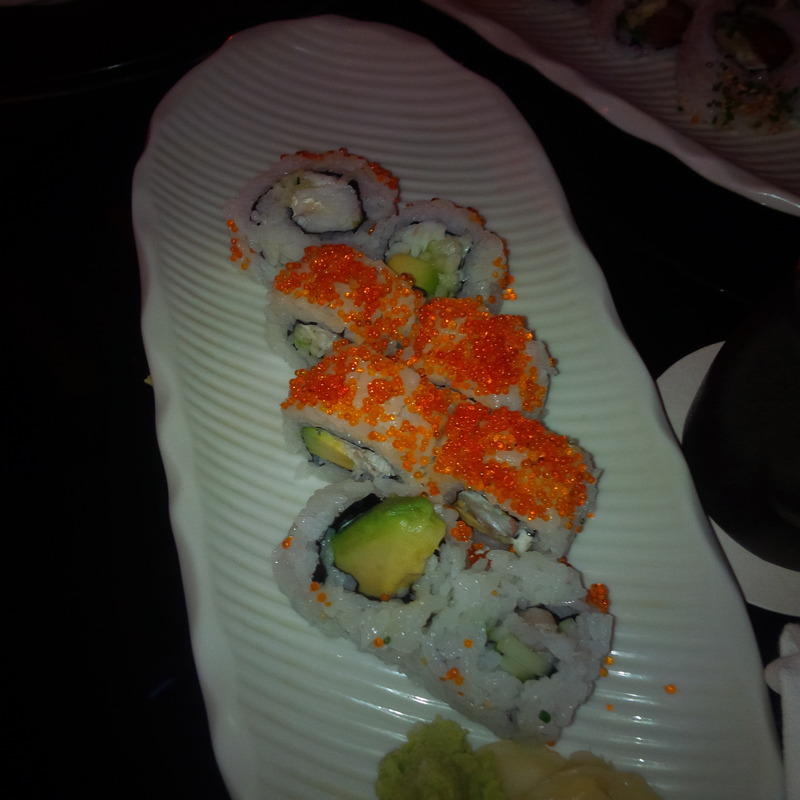 Love this sushi roll. The next cocktail is the Starhill Fizz. It was Maker’s Mark competition winner in 2010 and there is no doubt it was a worthy winner. The drink has it all, Maker’s Mark bourbon, punt e mes, cherry heering, french absinthe (best part of it) and some extras (lime, lemon, brown sugar) topped with ginger ale. It’s so amazing. There are a lot of flavours, but they don’t compete with each other, they sing like a symphony with a world class conductor directly all the flavours across your taste buds. Don’t ever drink this quickly, take the time to savour every drop and please drink all the foam – that’s where the flavour is! The drink has soft fizzy base with the different liqueurs and the distinct bourbon/citrusy after taste. It’s certainly full of flavour. A couple of glasses of Tellurian ‘pastiche’ Shiraz Heathcote, Victoria (2011) provide a much needed intermission to the cocktails. 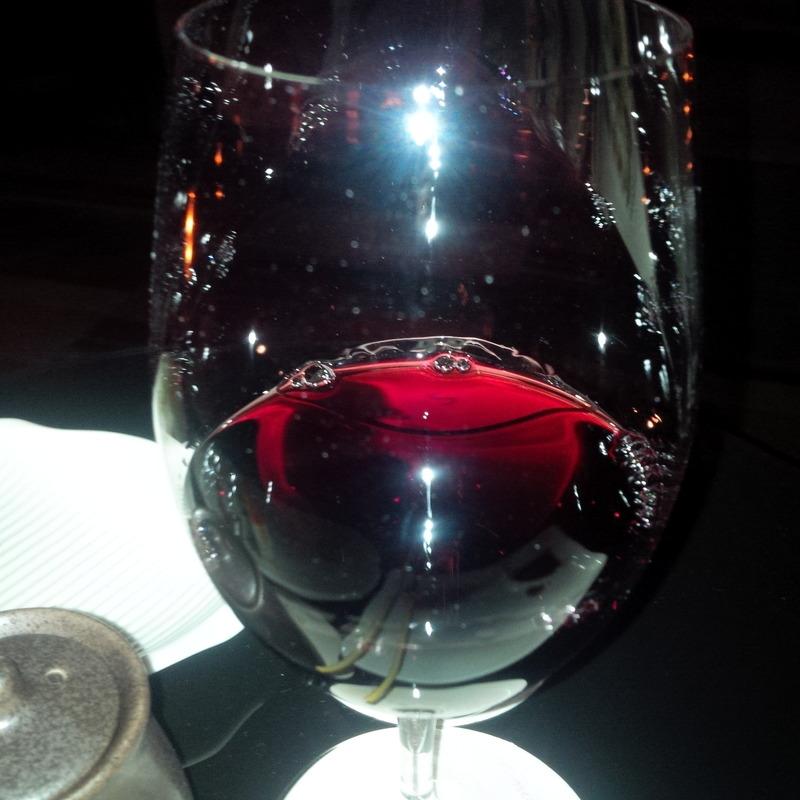 The wine is beautiful, medium bodied with fresh plum fruit flavours and balanced acidity. A very typical Heathcote Shiraz. Then it’s onto the Sauternes Deluxe Cup! A beautiful deconstructed cocktail which is as exquisite in taste as it is in appearance. 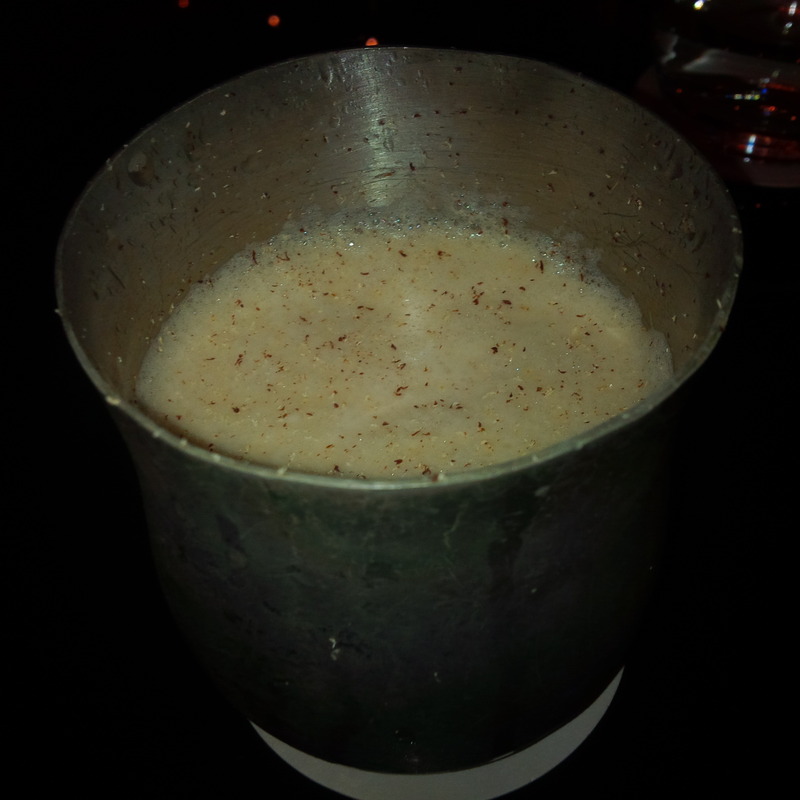 The Cup contains beefeater 24 gin, noble one botrytis, lillet blanc, peach brandy, bitters. 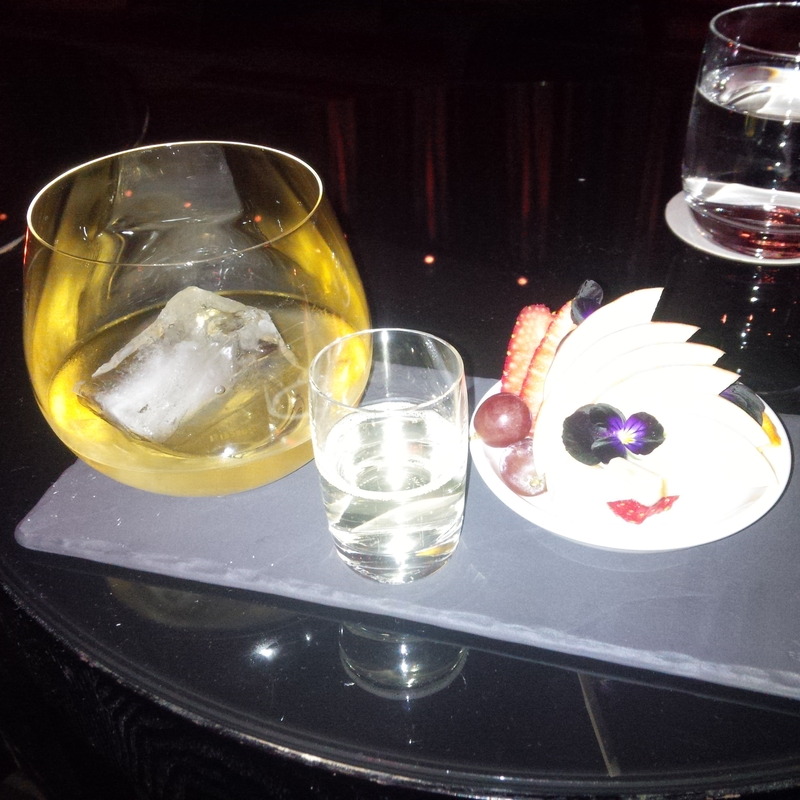 It is served with a selection of summer fruits and a shot of champagne to cleanse your pallet. I have this drink pretty much every time I am here, and every time I find a new flavour or a new angle. It’s the drink that keeps giving. I can’t think of a better way to finish a night on the town than sipping this drink. I can’t describe the drink in detail to you… one has to taste it to experience it. 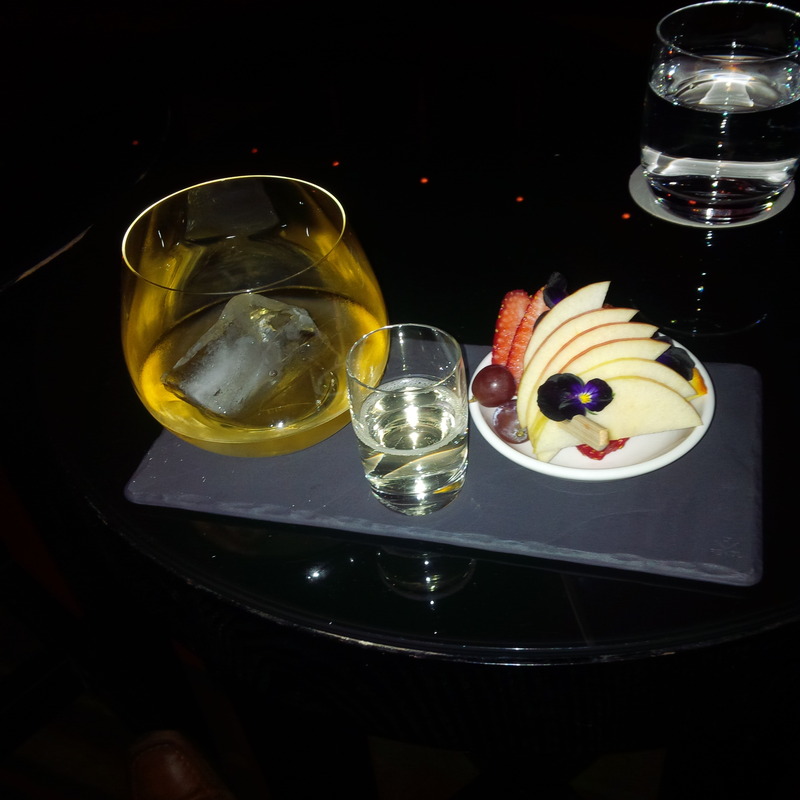 The sweetness of the dessert wine is balanced by the gin and the fruits on the side add that extra texture and flavour. It is a work of art. Hemmesphere is the place to be! Very few bars do cocktails, wine, food, service and atmosphere. This does them all and very well at that!